And now we come to it folks. Rolex’s most iconic (yes the term is overused, but this is where it fits) model, the Submariner. People everywhere know it. Even people who know nothing about watches know it. James Bond wore one before movie product placement was a thing. So did Steve McQueen. In fact in some circles, when you say “Rolex,” people assume you mean the Sub. So how did this watch come to be? The Basel Watch Fair in 1954 was all about new products for Rolex. There was a new Ladies Perpetual with chronometer rating. The Explorer took its bow and so did the Turn-O-Graph version of the Datejust. Even the nine-year old Datejust got into the act, featuring for the first time the now-instantly recognizable cyclops over the date window. But front and center when the curtains were pulled? A huge (for its time) new piece of stainless steel gear: the Rolex ref. 6204, a watch that would become known as the Submariner. The tool watch that would define the genre now saw the light of day for the first time. We say, “would become known” because at the time, Rolex did not yet own the name. but within 200 production units, Rolex owned the right to put the label on the dial. That first reference was good to 300 feet of water resistance, had no crown guards, and its bi-directional bezel was marked in 5 minute increments. Two years later, two new references took over the Submariner lineup, the 6536 and 6538. The 6536 was good to 100 meters or 330 feet of water resistance. The 6538 was good to a depth of 660 feet. These are the references collectively known as the James Bond Rolexes. There was a bright red inverted triangle on the rotating bezel at 12 and the big crown was still fully exposed. The hands were still stick shaped, but the so-called Mercedes hands appeared a few months into the new production cycle. Another two years passed and the 6538 got the new calibre 1030 movement, minute tick marks between 0 and 15 on the bezel, a Triplock crown (although it was not yet called that), and “Officially Certified Chronometer” lettered on the dial. At the same time, the new ref. 6200 was released with the old A296/775 movement and 5-minute-marked bezel. 1959 saw the introduction of the chronometer certified ref. 5512 and its non-chronometer brother, the 5513. Here for the first time was white printing on the dial where all previous versions had been gilt. The formerly red inverted bezel triangle turned silver. And crown guards first appeared to protect the most vulnerable part of the watch against blows, and thus damage, that could mean death to the diver depending on the watch. That same year saw the ref. 5508 debut. It was effectively identical to the old 6536, and likewise, was rated to 330 feet. In the early 1960s, the British MoD, the Ministry of Defense, came calling. 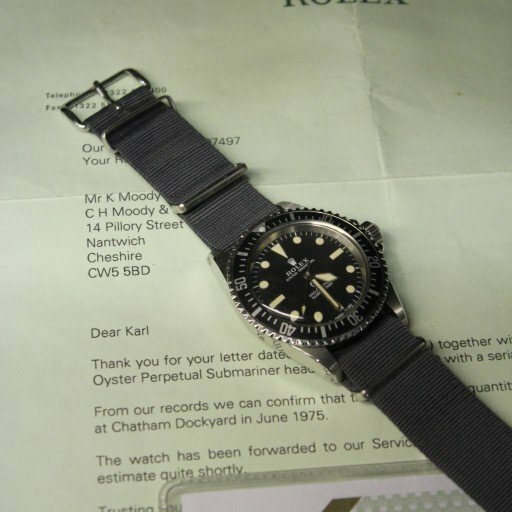 They favored the 5513 for their Royal Navy divers. But they had a few requests. No Mercedes hands for the boys in rubber. A sword hour hand and stick minute hand would do nicely. There were to be no one-minute markers on the bezel either. Just five-minute increments. As aficionados know, that changed. The spring bars were replaced with permanent bars welded in place, and a ‘T’ in a circle appeared on the dial, for the Tritium that had replace Radium by law. And thus appeared the watch collectors today affectionately call the MilSub. It was first issued to British divers in 1965. Also in 1965, Rolex released ref. 1680, which housed the new 1565 calibre. This was also the year 18K gold versions of the Submariner began to appear. 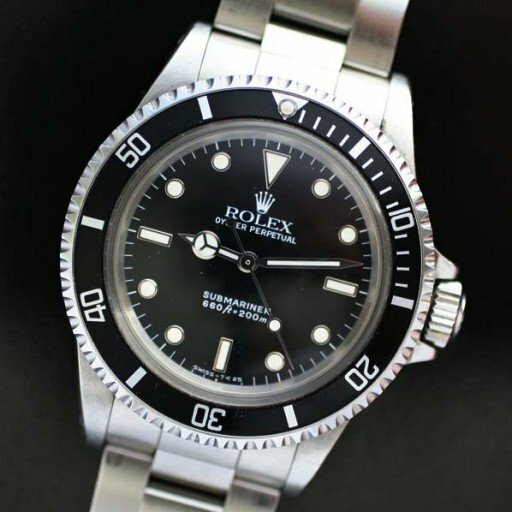 1971 saw the beginnings of a rapid evolution of one line of the Submariner. The ref. 1665 Submariner SeaDweller was introduced – the so-called “red Sub” due to the word Submariner printed in red letters on the dial. Around this time, world oil consumption had begun to rise dramatically. New sources of crude needed to be found. Deposits discovered in deep water looked promising, but getting men to work at those new depths was a challenge. Part of the challenge was equipping them with a watch that could withstand the rigors. Of course, Rolex, along with French company Comex, was up to the task. Next up, we’ll continue the Submariner’s story as we trace its evolution into the deep water juggernaut, the Sea-Dweller. And we’ll wrap up the story of the Submariner itself. Ever wonder about the backstory of your favorite Rolex? We hope you’ve been sticking with us. This is the sixteenth in an ongoing series of posts featuring histories of significant Rolex models. In all, Rolex has introduced nearly three dozen models since 1950. Ultimately, we’ll be touching on nearly all of them. You’ll find all the reference numbers connected with each model here.